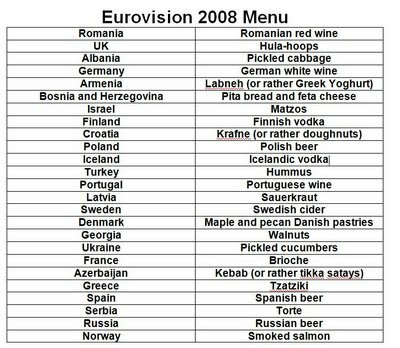 For last year’s Eurovision song contest I decided to create a list of food and drink, one for each country, to be eaten/drunk as the band played. It resulted in a strange mix of foods. Some look ‘surprising’ in retrospect (walnuts for Georgia? 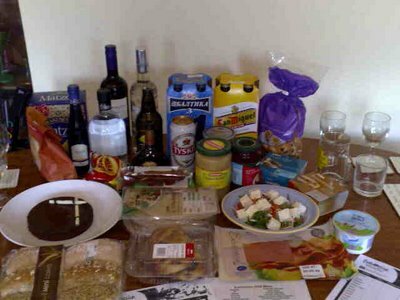 ), some were excessive (there is still vodka left), some were stretching a connection (Danish pastries! ), and some were just bad (NEVER eat smoked-salmon after chocolate torte!). It is actually very difficult to create such a list on your own, so this year I am attempting to ‘crowdsource’ my menu. Please head over to my Eurovision Menu Wiki Page and give me a hand by making a few suggestions.